Today we’re going to run through a mini Piano Man tutorial. Inside today’s lesson I’m going to teach you how to play one of Billy Joel’s most famous licks. This famous riff is not only found in Piano Man but you’re also likely to hear it in country piano licks, pop, rock, gospel, jazz, and even Irish tunes. It is a really valuable riff to have in your tool belt. So, let’s start learning! Take 3 minutes and watch as I break down this famous lick. 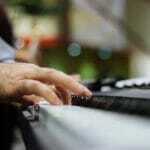 After watching this Piano Man tutorial make sure that you continue reading. I’ve got more important tips that will help you grow your piano skills. In rock music we often times just use triads. You know those 3 note chords that you build with the major 3rd, minor 3rd pattern? Triad voicings are made from the root of the chord, the 3rd, and the 5th. Think scale degrees. (1, 3, 5). And this pattern works across all scales. For this Piano Man lick you only have to focus on 2 different triads. The D Triad. Broken down it looks like this, (D F# A). (D) is of course your root. (F#) is the 3rd of the chord. And (A) is the 5th. The G Triad. Broken down it looks like this, (G B D). 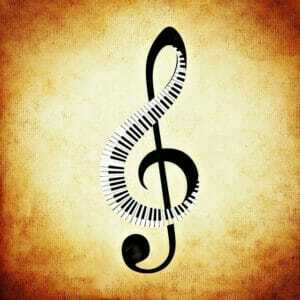 (G) is the root of the chord. (B) is the 3rd. And (D) is the 5th of the chord. Master these triads and getting this lick down will be a sinch! Now that you have your D and G triads down, you’ll want to pay attention to the chord decoration. You may have noted from the video that this lick uses simple 2nd to 3rd chord decoration techniques. For the D chord pattern, this means that you’re leaving out the root. Just play the 2nd and 5th of the chord, (E) and (A). On the next beat you’ll move from the 2nd to the 3rd, (E) to (F#). From there you resolve back into your standard D triad. Rinse and repeat this same idea for the G chord pattern. Decorating chords is a useful technique for discovering new sounds and melodies. Certainly try decorating some licks in your own tunes! Timing is everything! One of the keys to mastering this particular lick is to understand how to fill in a ¾ time signature. This is one way to write out the rhythm of this lick. On Beat 1: Just play a D chord. On Beat 2: Just play the 2nd and 5th (E & A). On The & of 2: Then move the E to F# while holding the A down. Beat 3: Resolve back to your regular D chord. Awesome news! It just so happens that the pattern for the second part of the lick is the exact same as the first. You just need to move it up a 4th. Transpose your D chord voicings up a 4th. (This will give you your G chord voicings). Put the D chord pattern together with the G chord pattern and that’s the whole riff! Pretty simple right? By the way, the more piano chord progressions and voicing patterns you know the better! Make sure you constantly build your knowledge of common chord progressions and voicing patterns. From there transposing up and down between keys is quick and easy. With this new riff added to your bag of improvisation skills try using it in your own tunes. The more you experiment with these types of variations the more sonic doors will open! More Amazing Tutorials For You! A primary goal I have for you is to teach you famous piano licks like this one. As I mentioned, this riff can be found in many different types of music. Now that you know how to play it, you’ll rapidly start picking it out of your favorite tunes. But your learning doesn’t have to stop there. If you want to learn more about decorating chords you can check out our 9th chord tutorial. In this tutorial you’ll learn how to take plain major piano chords and decorate them using the sweet color of the 9th. You’ll love this sound. In the meantime enjoy your practice. As always make sure you’re checking back to the site regularly. We are posting new helpful content all the time! If you have any questions or comments about the lesson or the video tutorial above please leave them below.